Advice on fitting Mazda RX8 seats. Anyone put these in? Anyone able to advise on how? 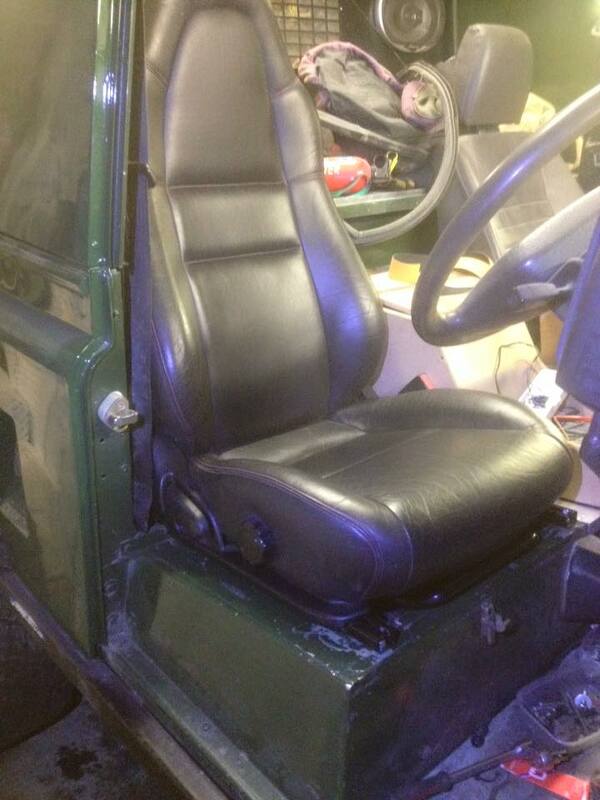 I've fitted Mazda seats to my Defender - brilliant pieces of kit and the electrics are easy to do. You also need to remember that seat adjustment is now part of the MOT so you may as well sort that too. any chance of some photos fatboy? Nice seats, aren't they a bit high, I know that Defenders have the higher windscreen than Series. I have Old Datson 120 seats on my LR which are comfy and look OK but I have to peer out under the top as they are a bit high. I now have a set of Ford Recaro seats to go in. So, can they be fitted without welding? i Picked up the seats today, look great. ill be fitting them tomorrow but in my opinion theres no welding necessary, just cut off the original brackets and bolt done thru the rails into the seat box. ENSURE YOU REMOVE ANY AIRBAGS !!!!CAREFULLY!!!! Very intrerestuing threwad / upgarde - watching to see whow these are fitted wired etc but puzzled re : Air Bags ????? Some seats have air bags in the sides for side impacts and to deflect the window glass I think. A Google search for seat airbags shows the pictures. ..........a description of where they are on RX8s and how to get at them / remove would be interesting / useful ? "removing the airbags is a simple 10mm bolt behind the SRS cover. the yellow connector IS the airbag power connector. nothing else"
Ok, A little More on fitting, sorry no pics ill get some tonight. AirBags- these are the side airbags and can be carefully removed my flipping up the SRS logo undoing a bolt and then the whole air bag can be lifted off (personally I dislike having them there at all so I then undid the 3 nuts holding the airbag to the metal plate, prized off the plastic cover, unfolded and cut open the bag and removed the airbag 'firing unit' then refitted the plate and plastic cover to the seats (Note: air bags can be very dangerous so anything you do to them is at your own risk and whatever you do - DO NOT let any electricity near to the units!! Next I cut off all the brackets under the seat rails, easy job, then line the seats up where you want them and bolt the rails straight to the seat box at the front, I found the original holes are slightly off, so I drilled new holes and fitted rivnuts, I then fitted approx. 6mm spacer under the rails so the drivers seat motors don't foul the seat box. Did I read that right, you've used rivnuts to secure the seats to the vehicle? A couple of months ago, I was looking for the wiring diagram for RRS heated seat controllers - and found a Ford Forum where a member had posted a photo of the underside of his drivers seat asking if the plug shown could be for heated seats? The plug was yellow! A couple of posts further on - there was a photo of the seat split open where the airbag had exploded out of the side. Guess it did heat up, albeit rather briefly! Top Tip - Avoid any yellow wiring! Aibags can be fun (with the standard dont try this at home warning). The ones i removed from my Audi A6 seats and the Merc i stripped for the motor got put to good use. I was able to get the merc steering wheel a good 30ft into the air, at the end of a long cable and fired by a 12v battery. If the seatbelt mount is to the seat thats downright stupid. Even if its to the body, thats a huge weight which is going to rip out in a crash and try to meet the nut behind the wheel. Have you ever seen a Defender? The seats and seatbelt mounts are different. Yes, i've owned 3. Your point is? One should do something dangerous just because its a Defender? If you mean that the belt mounts are direct to correct points, then thats one step better (if he hasn't used the seat mounts for the belts). But I would not want be sitting on 50kg of unrestrained mass in an accident. Recommending Rivnuts into 1.5mm aluminium for seat mounts in a write-up is not something that should be published on a responsible forum. It's not exactly difficult to use some decent spreader washers.